Australian Hunting Consultants can organise a variety of hunts in the North American Region. While we can arrange a custom package to suit your needs, by far our most popular hunting destinations in this region of the World are Alaska (a state of the U.S.) along with British Columbia and Alberta (both provinces of Canada). Our guided experiences in this region include hunting for many powerful species such as Grizzly Bear, Dall Sheep, Mountain Goats and Caribou in the pristine wilderness of Alaska to Elk, Mountain Lion, Black Bear, Shiras Moose and Wolf in the stunning terrain of Canada. Australian Hunting Consultants has the very best in North American hunting experiences so visit the links below for more details on these amazing hunting adventures or contact us today and let us organise your hunting experience of a lifetime. Australian Hunting Consultants have a solid commitment to service and client satisfaction. 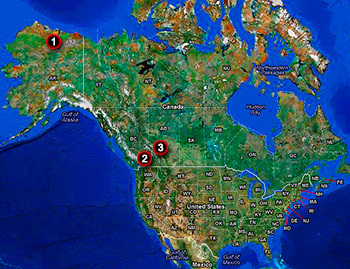 This will ensure your North American Hunting experiences run smoothly and successfully.